February 2019: Vote Now for a New Club Jersey! 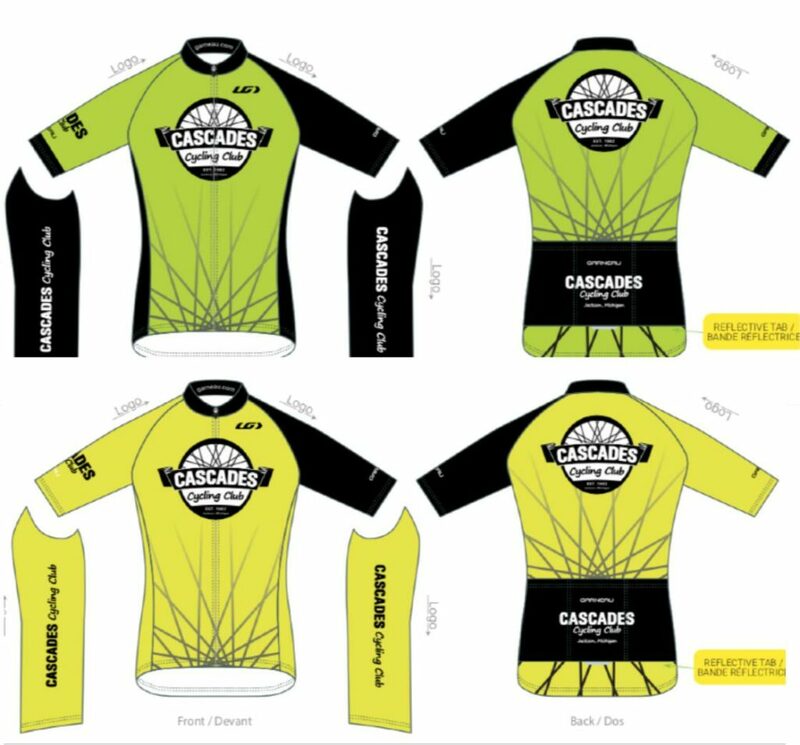 March 23, 2019 / Cascades Cycling Club / Comments Off on February 2019: Vote Now for a New Club Jersey! At the annual meeting we heard from a number of members who are interested in another club jersey sale. Shown above are two higher visibility designs to chose from. Send your vote of color choice to the club’s email address by this weekend and we’ll get the process started with the winning color! The DTE Energy Foundation Trail is rapidly becoming the most popular mountain bike destination in Michigan. With 3 separate trails (a fourth will be added this summer), it provides MTB riders with fast, fun, challenging rides. These rides also come with some risks, as club member and past president Ruth Riedeman learned last summer when she crashed while riding the Winn Loop with her husband John. Ruth and John learned the hard way that rescue personnel from the Chelsea Fire Department were not able to reach Ruth quickly because their Gator vehicle could not negotiate the narrow trails at DTE. 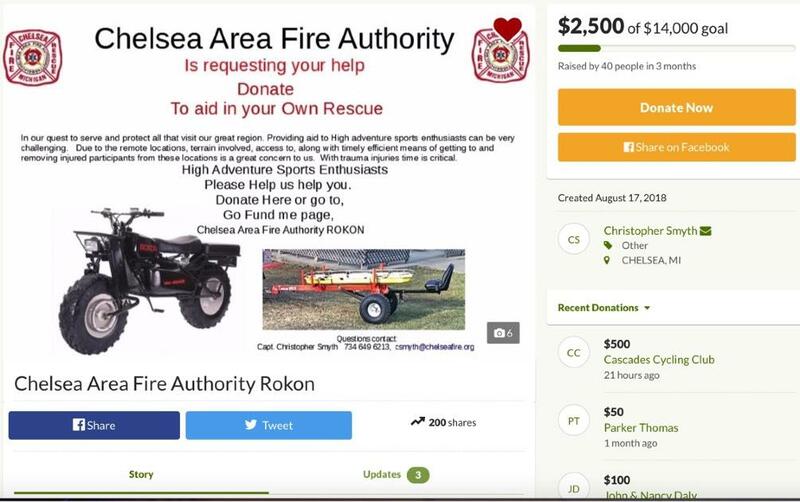 The Chelsea Fire Authority has started a Go Fund Me page to raise the funds needed to purchase a two-wheel drive motorcycle and trailer that will be used to rescue injured riders from DTE and other MTB parks in the area. As you can see above, the Cascades Cycling Club donated $500 to this fund last year. If you are able, please donate to this fund. You may be aiding in your own rescue! On Two Wheels is looking for part-time help. Business has been tremendous and we could use a few extra hands. We are searching for the following: A salesperson ( no experience necessary ) who would be willing to work Saturdays ( and maybe more? ); A mechanic who is already somewhat comfortable around bicycles. The mechanic should be willing to work a couple days a week ( or more ). Also, I would love to have a woman on the sales floor. If anyone reading this is interested in any of these positions, or knows someone who is, please stop in and see Pat or me at On Two Wheels, 550 Laurence Avenue, Jackson. We would love to talk to you! Register Now! Skip and his son Evan Say This is a Great Ride! Registration is now open on active.com for the 2019 Pedal & Whine Bike Tour! Our 2018 ride was a huge success, with 390 riders enjoying this great ride. 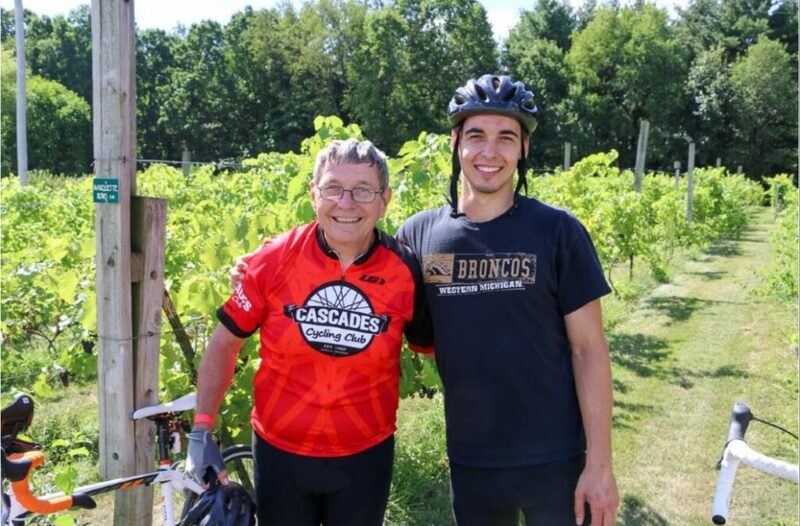 Heather Price of Sandhill Crane Vineyards has agreed to allow us to increase our attendance this year, so mark your calendars and plan to join your fellow club members for Jackson County’s biggest ride! How: Visit cascadescyclingclub.org to register today! Club Dues are Now Due! In case you haven’t already paid them, this is your reminder that club dues are payable each year on January 1. Your dues give you a voice in Lansing and in Washington as they allow our club a to be a member of the Leagues of Michigan and American Bicyclists. These organizations continually work to make our roads (both paved and gravel!) safer for you and your family to ride. Funds raised through dues help pay recurring annual costs like our website and insurance policy. Our insurance provides members with liability insurance in case you are sued, and supplemental medical insurance to cover your deductibles in case you are injured on a ride. 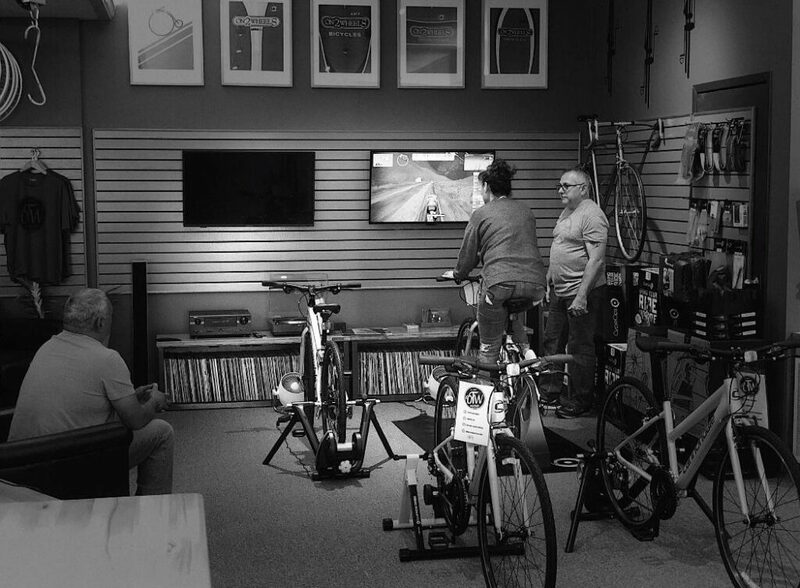 Membership in Cascades Cycling Club also gives you a 10% discount on parts and accessories at P&T Fitness and On Two Wheels. You can save money and be a commendable cyclist simply by renewing your membership. To renew, just click this link to go to our clubs website cascadescyclingclub.org where you will be able to renew online, or print an application form and mail it in with your check. Two Great Organizations – Two Great Rides! Group rides are a great way to experience riding on new roads and enjoy the security of a SAG supported ride. Here are two rides in June you might want to check out. 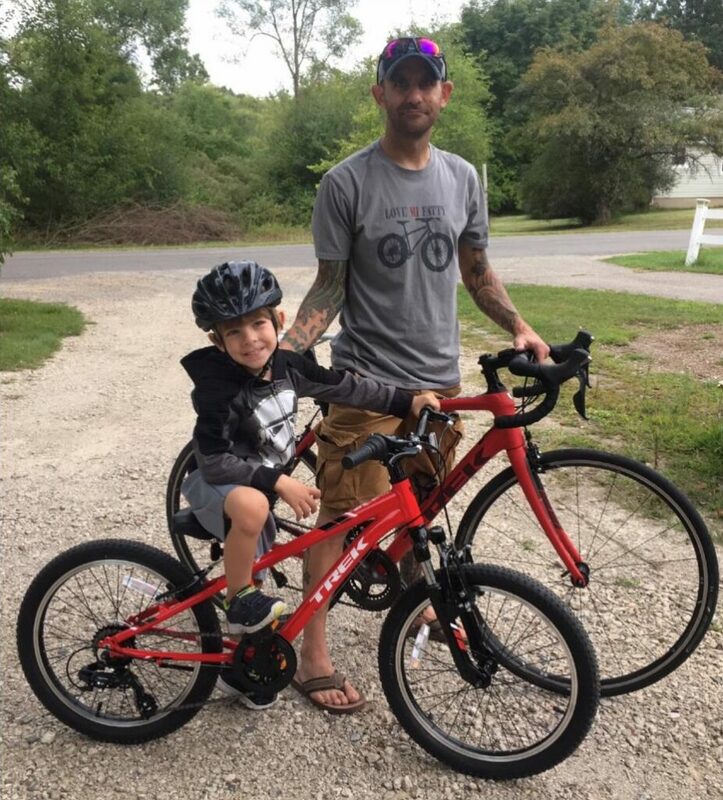 T-Shirt Ride – June 2: This ride is sponsored by the Tri- County Bicycle Association or TCBA. With a number of our club’s members also belonging to the TCBA, it is kind of like a sister club to ours. This ride begins at the Grand Ledge High School, features routes of 17, 34, 48 and 66 miles, and provides riders with a great lunch. Tour d’Eastside – June 1: Enjoy a pleasant 20 mile pedal from the Detroit River to Eight Mile and back along the Conner Creek Greenway. This is one of 4 annual rides put on by the Tour de Troit organization, which raises funds to support non-motorized bicycling and pedestrian infrastructure in Detroit. I volunteer to support this ride each year, and it is a great way to ride with other cycling enthusiasts and see some of the city of Detroit. This ride is SAG and, yes, police supported, and lunch is available for this ride as well. ← March 2019: Club Jersey Online Store Opening in March!